What is does “immature apices” mean? The apex of the tooth is the tip of the root. Your front teeth only have one apex at the end of the single root, while molars have multiple roots that form an apical foramen. So, when we refer to “apices” we are just referring to multiple (plural form) roots. To better understand the anatomy of the tooth we have included the diagram below. As you can see in the diagram, the tooth apices are at the root of the tooth. While teeth are maturing the apices are open. It is only after teeth are fully developed that the tooth apices close. So when we say immature apices we are talking about teeth that are not fully developed, which typically occurs in children or people under the age of 18. As mentioned previously, conventional root canal treatment usually is not a recommended course of outcome for immature teeth because the outcome is not as predictable in mature teeth. This is why coming to see an endodontist can be so critical. Endodontists are experts in treating infected roots, and they have other treatment options that are better suited to deal with immature apices such as, apexogenesis or apexification. These treatment options help to improve the chance of saving the tooth. Apexogenesis is a procedure that encourages the root to continue development as the pulp is healed. Medication will be placed on the soft tissue to encourage the development. The walls of the root canal will thicken as the child gets older. If the pulp heals, no additional treatment will be necessary. If the pulp is unhealthy, apexification is recommended. 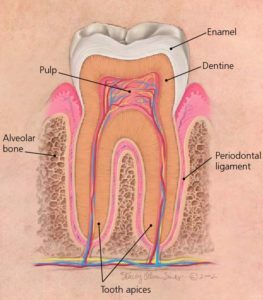 In apexification, the unhealthy pulp is removed, and medication is placed into the root to help a hard tissue form near the root tip, which then provides a barrier for the root canal filling. The tooth will not continue to develop, making the tooth susceptible to fracture. If your child’s tooth becomes infected before the roots are fully formed, call our office. Our doctors will be able to do a full evaluation and give you the best recommendation for the appropriate treatment.